Welcome to the fifth of the Lethal Lairs finalists, which are presented in no particular order. Our esteemed judges have enjoyed going through each of the entries for this contest, and now you can read each of the five they chose as finalists! After we present all five — unedited — you’ll have a chance to vote for your favorite. Thanks go to both our entrants and our judges for their work! And now, finalist Charlie Brooks presents you with “Ambush at the Oasis” — enjoy! According to legend, the blue wyrm Azdrar once looked upon his life and saw an emptiness that all his greed and machinations could not fill. Determined to turn over a new leaf, he spent the last decades of his life aiding travelers through the Sarklan Desert, serving as one of the only examples of a benevolent blue dragon the world has ever known. Whether Azdrar truly reformed or not, a small desert spring in the Hariek Hills holds his bleached white bones and a ring of desert lupines that always seem to retain a vibrant hue. It is said that the waters of the oasis sprang forth from the tears of remorse the wyrm shed and that they possess curative properties. The oasis has drawn the interest of the Red Cliff Raiders, who until recently cared about little more than shaking down travelers for whatever coins they could get. However, when stopping for rest at the oasis, the bandits disturbed the lamia Taaveshi, who has long lurked in the area in an attempt to unravel the site’s secrets. In short order, Taaveshi brought the raiders’ leader, Vadara, under her thrall and took over the group. Taaveshi’s takeover of the raiders did not come easily, as a number of the bandits fought against her despite Vadara’s orders against it. Those bandits, and others who fell in the battle, are now part of a carrion pile near the dragon’s bones which serve as food for Taaveshi’s jackalwere allies. Taaveshi herself is now in the process of deciding whether she should continue to investigate the oasis or move on before the remaining bandits grow too restless. 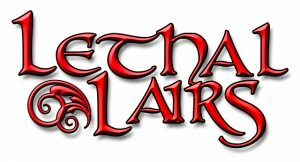 Fortunately, the arrival of the PCs offers an opportunity to give the bandits action and treasure while possibly also providing the lamia with spellcasters capable of opening up the oasis’ secrets. PCs may arrive at the oasis seeking water and rest, or they may have been hired by a healer from Siwal who believes Azdrar’s tears can aid him in the crafting of curative potions. Unless the PCs approach stealthily (requiring a successful DC 25 Stealth check), the bandits patrolling the oasis’ perimeter will see them. Fortunately for the adventurers, Taaveshi doesn’t plan to attack immediately. Instead, she has a simple solution to the problem of visitors: invite them right to the water’s edge. The great skeletonized corpse of a dragon lies with its snout buried in a field of inexplicably vibrant flowers. The rocky ground grows softer near the dragon’s body, culminating in a ring of emerald-colored grass that surrounds a still spring. The location of this oasis hardly seems like a secret, with ten canvas tents set up in the area. Most of the tents face the cool waters of the oasis, but others face outward, allowing the occupants a chance to see approaching travelers. Creatures: The remaining Red Cliff Raiders include the former leader Vadara, nine bandits, and a pair of jackalweres which serve her loyally. If Taaveshi receives advance warning of the PCs’ arrival, she uses disguise self to appear as a human woman in sandy brown robes. She introduces herself as a holy woman on a pilgrimage, with the bandits serving as aides and bodyguards in her journey. While conversing with the PCs, Taaveshi willingly shares any of the legends surrounding the oasis presented above. She takes this time to identify any obvious spellcasters in the group so she can charm them later and use their knowledge to unravel the secrets of the oasis. Vadara stays close to her new mistress. The lamia tries to deflect any questions directed at the former leader of the Red Cliff Raiders, interrupting any conversations directed at her. A DC 25 Sense Motive check reveals that Vadara is under some sort of controlling influence – in this case, drained Wisdom and a charm monster spell. When parlaying, Taaveshi and Vadara approach the PCs alone, but four of the nine raiders stay within 20 feet at all times. The others mill about the oasis, pretending not to pay attention to the conversation but keeping weapons at the ready should a battle break out. The jackalweres lurk in jackal form near the carrion pile in the northeast of the map. The bones of the dragon provide them with cover from anybody not approaching from the east. If the PCs notice them, they flee out of sight, then assume human form so they can join the bandits, claiming to have been exploring the area until just recently. If Taaveshi remains on good terms with the PCs during the initial conversation, she offers the hospitalities of the camp and leads them toward the water. At the same time, she signals to her raiders to be ready for an attack. The jackalweres assume hybrid form and the raiders move to surround the adventurers as soon as they reach the water’s edge. PCs who make a Sense Motive check opposed against Taaveshi’s Bluff skill notice the lamia’s signal and can act in the surprise round. Taaveshi opens combat by casting deep slumber, then targets spellcasters (or those who she believes are spellcasters) with her touch attack. The jackalweres get close enough to use their sleep gaze against those Taaveshi tries to touch. Vadara enters a rage and attacks the most threatening looking warrior, while the raiders attempt to establish flanking and do their best to keep strong melee combatants away from Taaveshi. If a fight breaks out before Taaveshi can lure the PCs to the water’s edge, the lamia immediately retreats to the oasis, with Vadara following suit. The raiders and the jackalweres move to intercept the PCs. Taaveshi uses her spells to charm or disable as many PCs as possible, then casts mirror image and moves to attack. Vadara fires her bow at the PCs until either half the raiders are defeated or Taaveshi engages in melee, at which point she enters a rage and engages in melee. Taaveshi fights until reduced to 10 hp or fewer, at which point she flees. Both Vadara and the jackalweres fight to the death, as do the raiders as long as either Vadara or Taaveshi live. If both are slain, the raiders flee when their numbers are reduced to three or fewer. Treasure: In addition to the gear possessed by each individual raider, a large treasure chest containing their latest spoils lies underneath the dragon’s skull. This chest contains six flasks of water drawn from the oasis, a scroll of owl’s wisdom, 100 gp, 1,200 sp, and a pouch of small irregular pearls worth 100 gp total. If the PCs lose: While the raiders don’t make a particular effort to keep the PCs alive, they don’t strike sleeping or charmed foes, nor do they perform a coup de grace on fallen combatants. If all the PCs fall, any survivors are bound and brought to the oasis for interrogation. Those reduced to negative hit points are stabilized and allowed to regain consciousness but not healed. Taaveshi uses her touch to drain each PC’s Wisdom once, then attempts to charm them into helping her study the oasis, joining the Red Cliff Raiders, or both. If she has used all her charm monster spells for the day, she keeps the PCs bound and guarded until she can recover her spell-like abilities. This may allow the adventurers an opportunity to escape during the night. Taaveshi attempts to charm each PC only once; if they continue to resist her after that, she feeds them to the jackalweres. Secrets of the Oasis: If the PCs defeat or drive off the raiders, the secrets of the Oasis of the Dragon Blossoms can be theirs. The water can be distilled to reduce the cost of crafting a potion of remove disease or a potion of cure serious wounds by half, although these potions only remain effective for a period of one week before losing their potency. 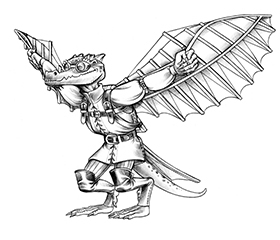 The dragon’s skeleton is mostly intact and may, at the GM’s discretion, answer questions if subjected to a speak with dead spell. In this case, Azdrar may share his knowledge of hidden treasures within the desert, the truth behind the legends about his redemption, and any other potential plot hooks, history, or advice the GM would like to provide in order to drive future adventures. The idea of the waterfall is evocative. Like including elements like Mharoti and the Trollkin and the doggy named Twofy. Oops, posted in wrong spot. Charlie, what I like about yours was the blue dragon legend turned on its head. 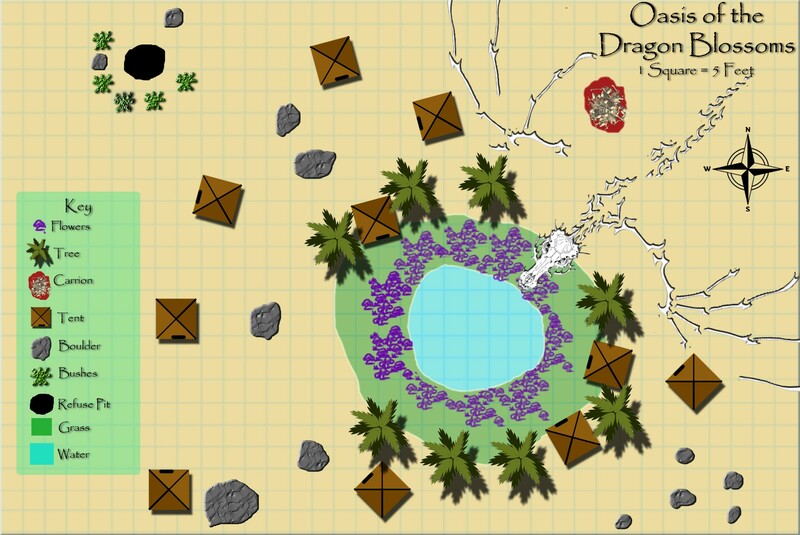 Good map, especially the way the dragon is pointed at the oasis. Jackal weres is a good tactical choice.